This is the first in an emerging series of my personal art. These images combine a photographic image with digital watercolor in a study of color, energy and flow. The circles in the image represent two Dressage training patterns (the 15 and 20 meter circles). The larger circle is the most important of training patterns and is ridden from the earliest stages of training all the way to the Grand Prix level. 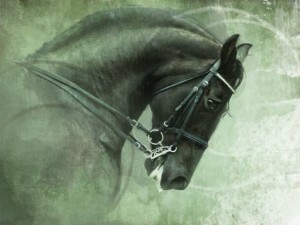 This circle reflects the suppleness of the horse and the communication it has with its rider. The smaller circle is used when the horse and rider are gaining more skill and control and is usually ridden at a canter. This circle reflects the growing power and balance of the horse with this more challenging work. Together they reflect the gentle guidance from the skilled rider by way of the bit and the supple engaged response of the horse as it appears to effortlessly ‘dance’ across the riding arena.